As subnational governments’ responsibility for resource allocation and service provision has increased, so has the importance of transparency, participation, and accountability at the subnational level. 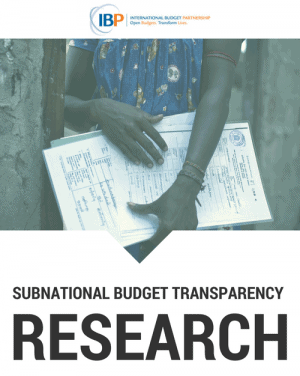 Recognizing this, as well as the scarcity of academic and policy literature on the subject, the International Budget Partnership implemented two rounds of subnational budget transparency studies that were completed in 2011 and 2013. Each round of the subnational studies used a different approach to develop the transparency assessment methodologies and instruments. IBP used these experiences to develop a questionnaire and a methodology to aid civil society organizations in conducting budget transparency studies at the subnational level. The methodologies for these studies was developed by the International Budget Partnership and drew on the national Open Budget Survey as well insights from our research partners. The methodologies for these studies were developed by IBP’s partners in Argentina, Brazil, Bolivia, Croatia, Ecuador, India, Indonesia, Mali, Mongolia, and Peru. These organizations also conducted the studies.